The existing Norwich Crown Point Railway Depot is operated by Abellio Greater Anglia. The £40M enhancement and modification of the existing depot facilities is being carried out by Vinci Taylor Woodrow to service and stable new trains being introduced to the Greater Anglia Railway Network. The enhancements and modifications are being undertaken to convert to depot while the depot remains functional and the upgrade includes new extensions to the existing railway sheds and modifications to the layouts of Yard Sidings and Shed Tracks known as Roads. New servicing plant is being installed which includes whole train synchronised lifting Jacks, overhead monorail based lifting hoists, diesel fume extract systems, new depot to train power supplies, depot protection equipment, new train effluent cleaning systems, known as CETs, and additional Carriage Wash Facilities. Increased Substation capacity to provide enough power for the new electrical loads. 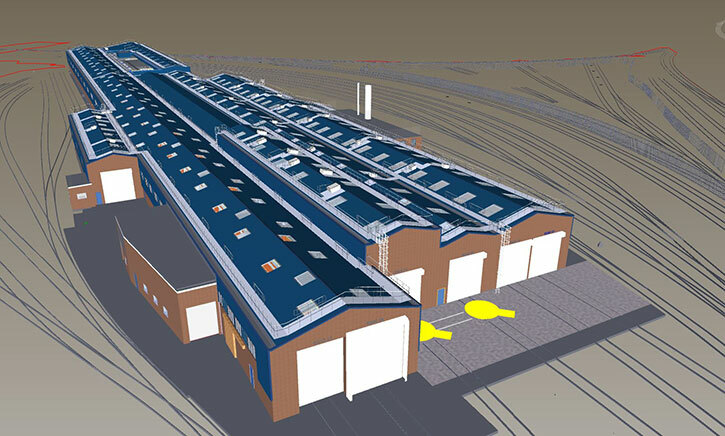 Complete refurbishment of Roads 16 and 17 Sheds including the MEP services, heating and ventilation plant and compressed air supplies. New MEP services to the substantial extension of Road 14 Shed. New office facilities being formed at ground and first floor levels. New Wensum Triangle sidings yard lighting. New power supplies to depot yard CETs and Carriage Wash Facilities.